Resale prices of private homes slipped lower in July according to Singapore Residential Price Index (SRPI) estimates, which were released on Thursday (Aug 28). The SRPI, compiled by the National University of Singapore's Institute of Real Estate Studies, showed overall prices fell 0.3% in July from the previous month. 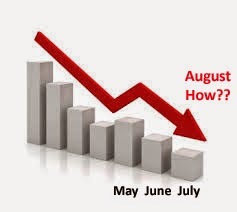 In June, prices fell 0.5% from a month earlier. Prices of small unit homes led the decline, with a 0.8% fall in July from the previous month. A small unit has a floor area of 506sqft or below. Prices of homes in the central region, excluding small units, declined 0.7% on-month. However, home prices in the non-central region edged-up 0.1% in July from June. These figures exclude prices of small units in the non-central region. Despite the consecutive fall in resale prices for June and July, some may argue that the % drop were rather insignificant. While the wife and I cannot disagree with that one, we are always mindful of the Chinese saying "积少成多" - literally translated as "accumulation of little becomes a lot". 2 comments to ''July resale prices slipped... yet again!" (a)if you have sold your exitsing property yet again? (b)whether you will be looking to buy or bought? (c) if looking to buy or bought, where did you buy? (e) do you think its worth to pay ABSD? (f) will you pay ABSD? (a) No. We have been living in the current property for about 3 years now. And since we bought it just after the Seller's Stamp Duty was implemented, we will probably stay put for another year at least before we consider selling. With market sentiments as is right now, there are no "pull factors" to sell it earlier anyway. (b) We are probably still at the "just browsing" status as there is no real impetus to buy. And the next move is likely to be our last given that both the wife and I are no longer as young as we used to be. But as our parents are aging, we may have to look for a bigger property so that they can move in with us in the next few years. (c) We are not very attached to any area per se. What are more important to us is the layout of the apartment and whether the price makes sense. (d) We currently own more than one property but only one of these is in Singapore. (e) The question is rather subjective depending on an individual's circumstances so a broad stroke response may not do it justice. But given OUR circumstances, it will probably not be worthwhile for us to pay ABSD. Having said that, we have always sold our existing property before buying a new one when comes to local purchases. So the ABSD will not apply to us if we continue with our typical M.O. (f) Think I have already answered this one in my previous response. Then again, we also subscribe to the notion of "never say never". Hope the above suffice. Have a good weekend!